For me the message of the dandelions has been part of my experiences since childhood, seeing a field of dandelions in wake-up dreams while hearing "Dandelions are free" as the seeds blow freely into the wind then disappear. 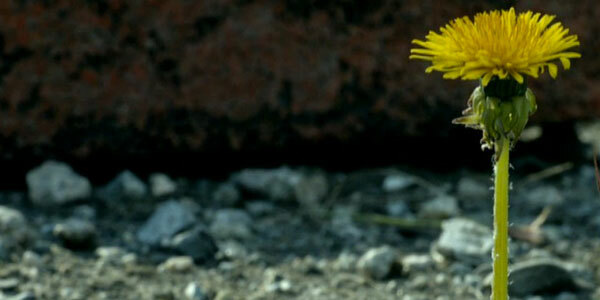 The TV series Fringe has incorporate dandelions into their series finale. It starts in the year 2016 as Peter and Olivia's daughter Etta, age 3, is seen blowing on a dandelion the day she was taken by the time traveling Observers. The episode moves to 2036, with the main characters looking the same as they have been preserved in amber, trying to save the world. Walter finds that the Unifier device - given to him in 2016 by September to help him remember how to stop the Observers - activates when he touches it - but his memories appear to be lost because the one of the Observers has done something to them. Etta, now 23, and the only character who has aged, surmises that his memories were destroyed and the plan to save the world is lost. A despondent Walter tries to sleep but is distracted by reflections from outside, which he traces to a makeshift sculpture made of broken CDs glistening in the sunlight. In a tote bag nearby he finds an undamaged CD and plays it on a car's stereo while knowingly looking at a seahorse hanging from the rear-view mirror. As Walter mulls emotionally, he spies a single dandelion growing from the rubble and cries to himself. This to him is the ultimate sign of hope in this wasteland desolated by the Observers - a lone dandelion with the strength to crack the pavement. Could it be a sign that their hope is pinned on Etta? The symbol for Walter is the White Tulip. The symbol for Etta is the dandelion. Time flashes back to 2015, where Peter, Olivia, and their young daughter Etta are enjoying a day in the park. The Observer invasion does not occur, and the family returns home. When Peter checks the mail, he finds an envelope addressed to him from W. Bishop, containing only a piece of paper with a drawn white tulip on it.